Following a college career in which he was a consensus first-team All-American and Atlantic Coast Conference Player of the Year for 1980, Taylor was chosen in the first round by the Giants in 1981 (second overall). It was expected that he would start right away, and he did with an immediate impact. Not only was he the AP Defensive Rookie of the Year, and a consensus first-team All-Pro and Pro Bowl selection, but he was selected as NFL Defensive Player of the Year by the AP. Giants went 4-5 to finish tenth in the NFC, divisions having been eliminated due to the strike-shortened nature of the season. With his attacking style of play, Taylor almost immediately set new standards for outside linebackers and continued to excel with his excellent speed and ability to disrupt running as well as passing plays. He was a consensus first-team All-Pro in each of the next four seasons and a Pro Bowl selection over the next eight. Taylor continued to be the leader of the Giants defense, including 1986 when the team won the Super Bowl and Taylor received consensus MVP as well as Defensive Player of the Year honors from the AP for a third time. He achieved consensus first-team All Pro honors a total of eight times in addition to the 10 Pro Bowl selections in a career that spanned 13 years and 184 games. 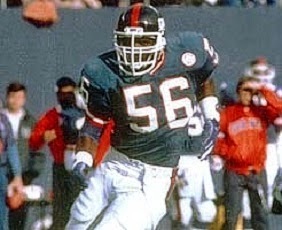 Taylor retired following the 1993 season, with 132.5 career sacks, and his #56 was retired by the Giants. He was inducted into the Pro Football Hall of Fame, Class of 1999.